Google's cloud productivity suite, whatever you want to call it, has been making inroads in the world of work and collaboration. And it's not just because there's no software to install, it auto-saves your work, and it's free. The recent surge in Chromebook sales also means users are looking to get work done with web applications more than ever. While it still can't stand toe-to-toe with the standard-setting Microsoft Word, the Docs app is no slouch when it comes to writing and editing documents. Its collaboration tools, including the recent addition of Suggested Edits, are as good or better than Word's in many respects. Here's how to use Suggested Edits, Revision History and Docs' preferences to reap the greatest benefit from Docs. When you're collaborating on a document, sometimes you'd just like to make a suggestion to the original author without altering the words. Before now, you'd have to type in comments in all-caps or between asterisks and hope that the you or the author remembers to remove them later. Google recently introduced a non-destructive way to make changes and edits. On the far-right side of the toolbar underneath the Comments button, click Editing. A drop-down will appear with the options to enter Suggesting or Viewing mode. 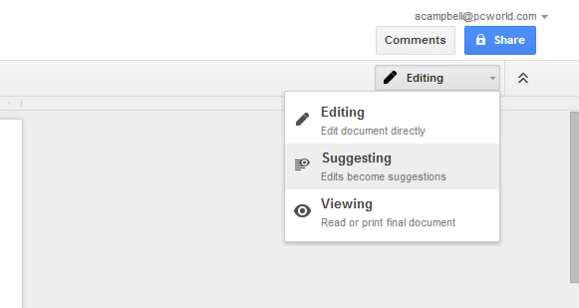 Suggestion mode allows anyone who can edit the document to suggest edits to the document owner. The owner can accept or reject edits. 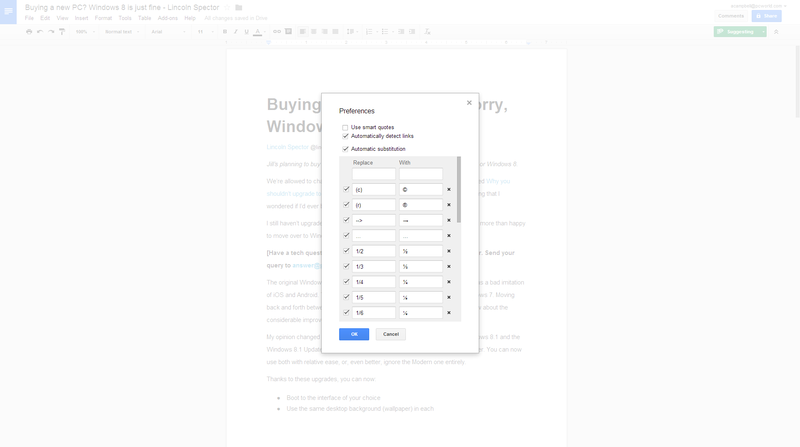 When you make changes to the document in Suggesting mode, your typed text is surrounded on the top and bottom by a bracket, and deletions are shown with a strike-through. A special comment card will pop up on the right as well. The card has check-mark and and 'x' buttons, so whoever has editing permissions on the document can accept the changes or dismiss them. Users can also discuss the suggestions by typing text into the Reply text box. Suggestions look a lot like comments, but are tied to actual edits to the document. Anyone who can comment on the document can enter text in Suggesting mode. 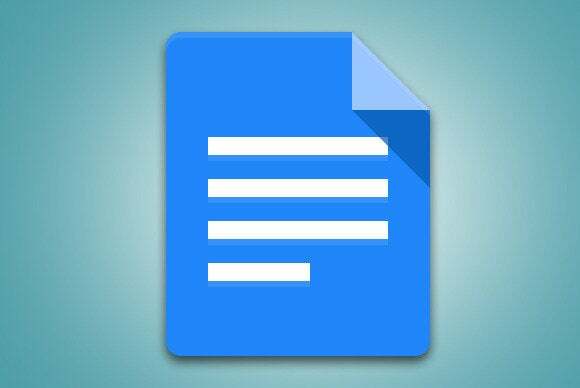 Edits made from in a Word document with Track Changes turned on will automatically be converted into suggestions in Google Docs. If you download the document as a .docx file, suggestions will be shown as tracked changes in Word. In Viewing mode, suggestions and comments are hidden, and the document is shown as it will be printed. 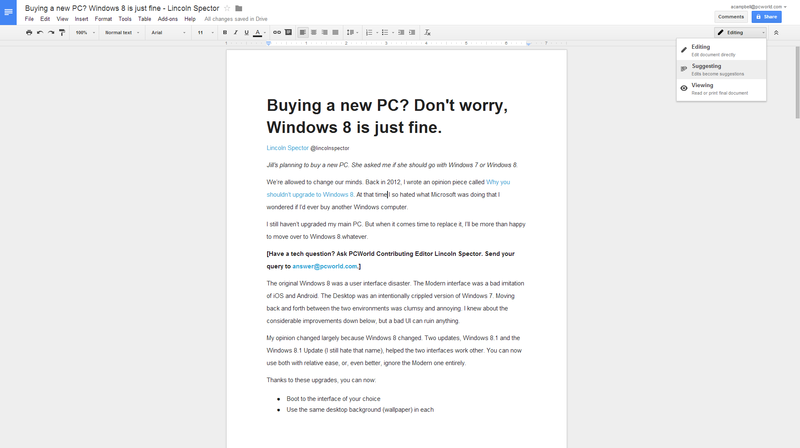 You can't edit the document in Viewing mode. Revision history is a great feature if you ever need to undo a change that's been autosaved. It's also useful if you want to see what other users with edit permissions have changed in the document over time. To use revision history, click File > See revision history, or use the shortcut Ctrl-Alt-Shift-G. The revision history sidebar will show major edits, from each time the document was opened. To view the changes from each auto-save, click Show more detailed revisions. 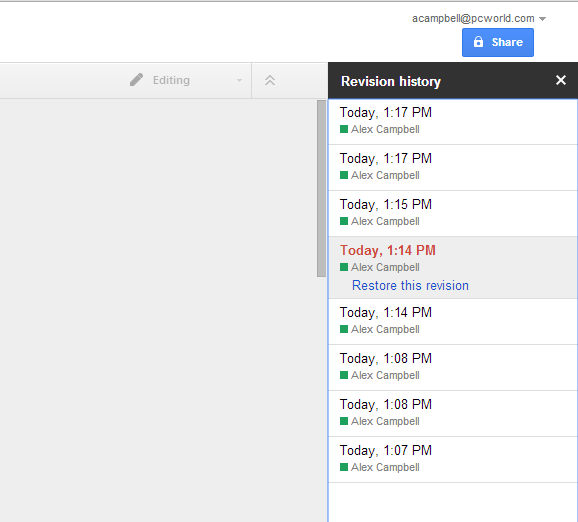 The Google Docs revision history allows you to go back to a previous version of the document, just in case you deleted something and closed your browser. Edits will appear in the color of each user, so Dave's edits may appear in green while Megan's may appear in orange. You can also view previous versions of the document by clicking on a revision in the sidebar. If you want to go back to the version you're viewing, click Restore this revision. To open the preferences dialog in Google Docs, click Tools > Preferences. In the preferences window, you'll see three check boxes and a two-column table. 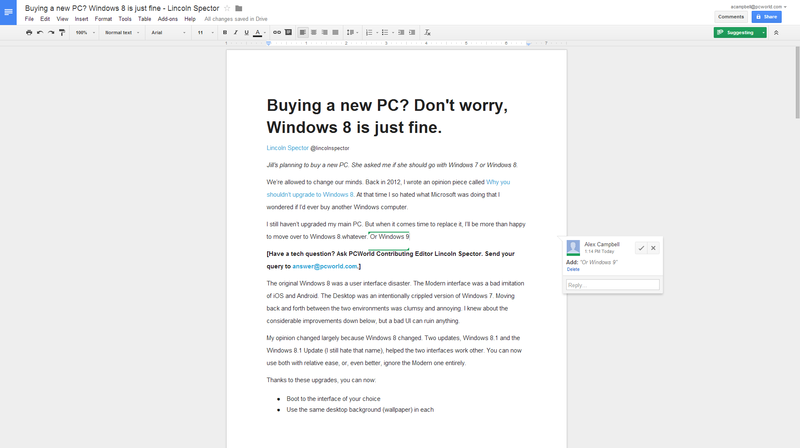 The preferences for Google Docs are very simple, yet powerful. The first checkbox controls whether to use "magic quotes," or as I call them, "curly quotes." 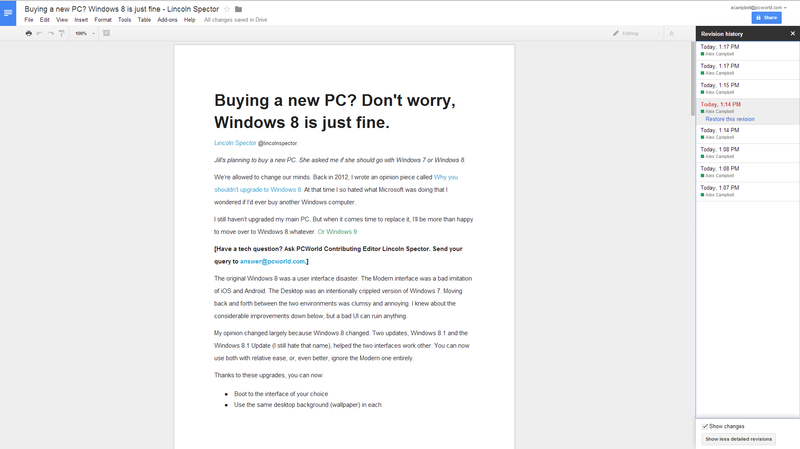 When checked, Google Docs uses quotes that curl up at the beginning of a quote, and curl down at the end of the quote. When left unchecked, both opening and closing quotation marks look the same, and don't curl at all, just like typewriter quotation marks. This setting also affects apostrophes and single quotes. Some programs may not handle curly quotes very well. If you do a lot of copying and pasting outside of word processors and don't want to fix your quotation marks all the time, try leaving this box unchecked. The second checkbox is pretty self-explanatory. It converts all URLs and email addresses typed or pasted into a document into a clickable hyperlink. 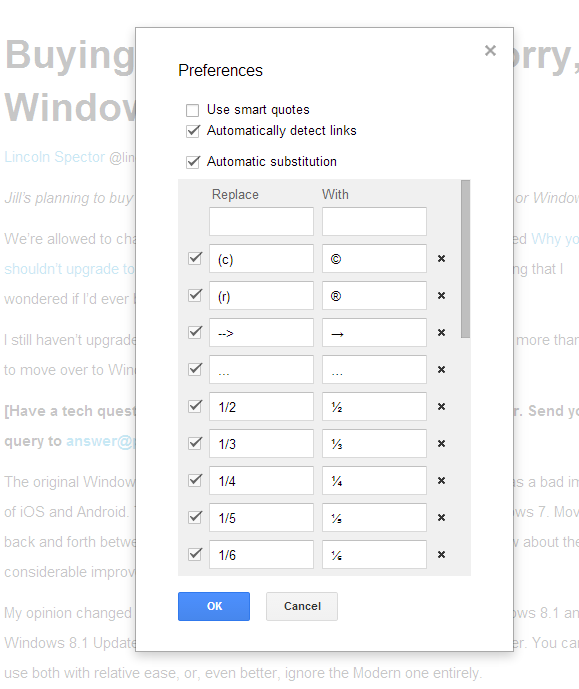 The third checkbox toggles character substitution in Google Docs. Character substitution is really powerful, as you can tell Google Docs to convert any character string into another set of characters on the fly. A great example of this is the copyright symbol, which uses (c) to create ©. Google Drive comes with several substitutions set by default, but you can add and remove any combinations you like. To add a combination, type the text you want as the shortcut in the top box of the left column. In the next column, type the replacement text. If you want to substitute a symbol, insert a symbol into a document by clicking Insert > Special characters. Select and copy the symbol to the clipboard (Ctrl-C) and open the preferences dialog again. Then, enter your shortcut text and paste (Ctrl-V) your symbol into the appropriate columns. When you're done, click OK and try out the new shortcut by typing the shortcut text and pressing the spacebar or Enter.